Queensland Blue pumpkins are, as their name suggests, an old Australian heirloom blue-skinned pumpkin ideal for growing in the subtropics. The year that Queensland Blue pumpkins were first grown is unknown but they were first grown overseas in 1932 so their origin in Australia predates this. Queensland Blue is a versatile pumpkin variety that is great roasted, chopped in curries or blended into soups. It's thin skin means that this pumpkin variety has delicious, orange flesh that goes most of the way to the edge, but the skin can also be eaten and adds a nice crunch when left on pumpkin pieces, seasoned with herbs and roasted. The seeds can be roasted and eaten as pepitas. Pumpkin flowers are edible and are delicious fried when stuffed with tasty fillings or coated in tempura batter. Young pumpkin fruits and shoot tips can also be eaten and are great diced in a stir fries, the young pumpkins taste similar to Summer squash when eaten this way. Uncut Queensland Blue pumpkins keep for a long time when stored in a cool, dry location. Choose a growing site that receives full sun or very light shade. Pumpkins are heavy feeders so dig lots of organic fertiliser, well rotted manures, worm juice, worm castings or compost through the soil to feed them as they grow. Push soil and compost into mounds and plant your pumpkin seeds into these mounds to ensure that your pumpkin plants have good drainage. Pumpkin plants are large and can smoother other plants in your vegetable patch so give them plenty of room to grow. Water pumpkin plants regularly so that their leaves don't wilt and the fruit fill out well. Pumpkins have separate male and female flowers, the females will have a small immature fruit beneath the flower whereas the males will have a straight stem beneath the flower. If the immature fruits turn yellow and fall of it means that they have not been pollinated, you may need to hand pollinate your pumpkins if this is the case. To hand pollinate pumpkins take a male flower and remove the petals, then rub the pollen containing anthers of the male flowers onto the stigma of the female flowers. Pinch out the growing tip of the main shoot when it is a few metres long to encourage your pumpkin plants to produce more lateral shoots which will result in more female flowers. Sow Queensland Blue pumpkin seeds in September or October in temperate regions of Australia, ensuring that any chance of frosts has past. Queensland Blue pumpkin seeds can be sown all year round in subtropical and tropical regions of Australia. Plant pumpkin seeds directly in the soil where they are to grow as they dislike being transplanted. Sow Queensland Blue pumpkin seeds 3cm deep spacing plantings about 1m apart to create a dense, productive mat of pumpkin plants. Queensland Blue pumpkin seeds take between 8 and 14 days to germinate once sown. Queensland Blue takes between 17 and 19 weeks to produce full-sized pumpkins. 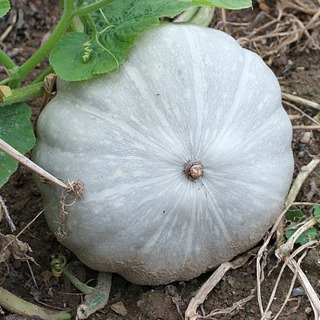 But shoots, flowers and young pumpkins can be eaten as soon as they are ready to pick.